This morning, because of the light in the sky, I took the above photo looking to the southeast from my porch. You can see the light grey gravel trail into Whatcom Falls Park. Looking at the photo, I noticed two Wood Duck (Listen) nesting boxes. 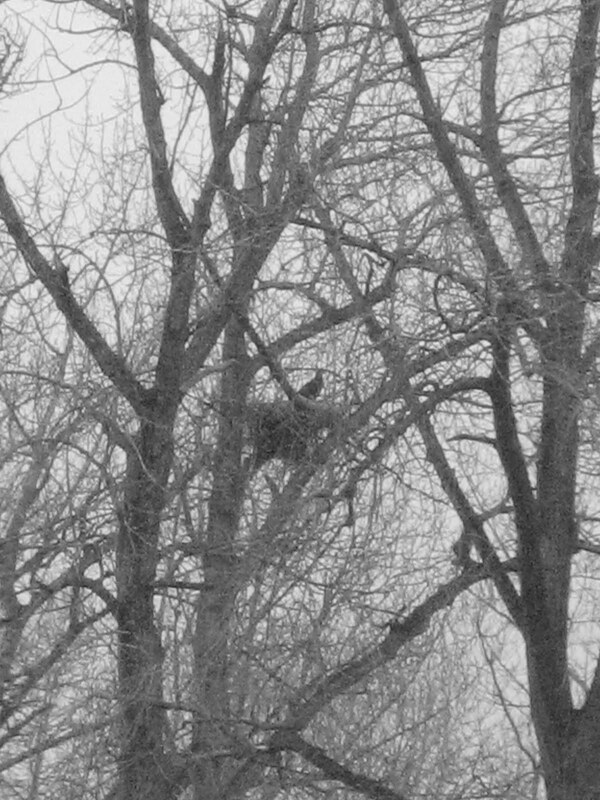 Looking up just now, I saw one of the Bald Eagles (Listen) carrying branches to their established nest that I can see in the cottonwood grove to the northeast. Yesterday I took the photo below. For some reason, the zoom worked better in black and white. The bird in the nest yesterday did not have the white head of a mature Bald Eagle. Now I'm wondering why a "yearling," if that is what it was, would return to its nest of birth. Could it have been an Osprey? That seems unlikely. This morning a group of Canada Geese (Listen) arrived at Scudder Pond. A clear sign of spring! Neat. Spring can't be far behind, can it? As long as I've been taking pictures of Wood Ducks I've never heard the sound on the Cornell page. Loren: It's funny about those Wood Duck sounds because I have heard those sounds as I sit at my desk with the window open but did not realize that they were the sounds of Wood Ducks. It was the same way with the Bald Eagle sounds. I heard them long before I realized their source. I played the sound of the Wood Duck, and it completely startled our kitty cat. What a surprising sound. We saw Wood Ducks in our pond on the day we moved into our house. We hope to put up nest boxes for them this spring. I miss the sound of Bald Eagles.